Excluding situations where you die from accidents, the main reason for death is -generaly- diseases. But I've never heard of any study that said: "people can't live longer than x age because the heart can't live longer than that". From my point of view, I think it's us who control the way we live and consequently someone can live longer than the other. For example, smokers die at an early age. But even the oldest person in the world, lived for 122 years and 164 days. For me this isn't enough. It seems that someone can't control his age after all. Basically my question is: Does science provide any limit that a person isn't able to live more than it? For instance can someone live more than 1000 years? It is by no means difficult to imagine a genetic endowment which can favor young animals only at the expense of their elders; or rather at their own expense when they, themselves, grow old. A gene or combination of genes that promotes this state of affairs will, under certain numerically definable conditions, spread throughout a population simply because the younger animals it favors have, as a group, a relatively large contribution to make to the ancestry of the future population. Imagine that there is a gene that changes calcium metabolism so that bone heals faster, but the same gene also causes slow and steady calcium deposition in the arteries. Such a gene might well be selected for, because many individuals will benefit from its advantages in youth, while few will live long enough to experience the disadvantage of arterial disease in old age. Even if the gene caused everyone to die by age 100, it would still spread if it offered even minor benefits in youth. This argument does not depend on the prior existence of senescence. 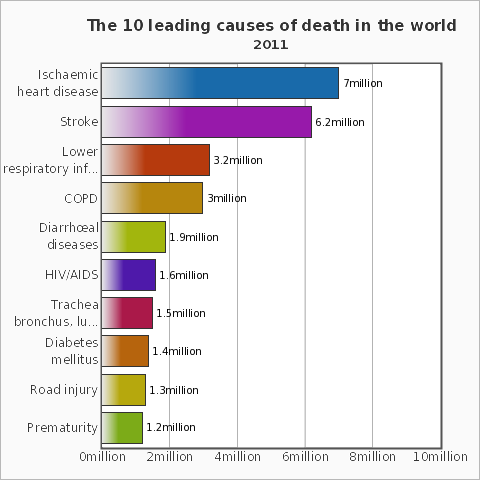 Other causes of death—accidents, pneumonia, and all the rest—are sufficient to reduce the population at older ages. Nor does the theory depend, like Haldane’s, on cessation of reproduction. The message I am trying to get across is that - As organisms are like vehicles which carry DNA and DNA just "madly" wants to replicate itself and pass itself from generation to generation, Natural Selection will favour those traits that maximise reproductive success. These may be traits that provide maximum benefit in youth but cause gradual damage and lead to senescence and death. You could also think like this - Every machine has wear and tear and must be thrown away after it is irreparable. Same is with our body, it is the most beautiful machine in the world but it is also subject to the same wear and tear. Also there is the end replication problem. See telomeres if you dont know what I am talking about. There is a limit to number of times a cell can divide. So all in all I would say that there is a biological limit - a certain age up to which a person may live. Your body knows it should die. Science discovered the details for us to understand. It is called apoptosis: pre-programmed cell death. The DNA in our cells is encoded to replicate only a certain number of times. Thus organs wear out as the cells are not being faithfully replaced (there are other factors to aging as well). It probably evolved since a population of organism that do not die will become overpopulated, consume all the food and all die out. Imagine how many people there would be if we never died due to cancer or organ failure. Would we be stacked a mile deep? Conversely cancer is a phenomenon when one or more of the mechanisms (genes) involved with apoptosis are turned off due to damage or mutation of the DNA. Cancer cells then become immortal, replicating indefinitely and continuing to mutate. This causes tumors and problems as there are large masses of non-productive cells taking up space and consuming nutrients. So yes there is a limit. A 1000 year old person would not be possible unless someone developed a way to control apoptosis while at the same time not producing a cancer, preventing normal genetic drift, and eliminating other aging factors. Naturally there is a lot of money to be made in extending life so this field is being researched. A near immortal creature could also spontaneously evolve due to random mutation. Similar to someone with a mutation for three perfectly functional arms, or the ability to shock people like an eel, a viable person with genetic near immortally would be highly improbable. Not the answer you're looking for? Browse other questions tagged human-biology mammals speculative organs or ask your own question.